Driving through arid landscape, hypnotised by endless horizon, I momentarily do a double-take. To my right, stands a giant veil, translucent and dimly aglow in the evening hours; a mirage-like apparition standing in an unexpected oasis. Palm groves shroud me in shade as I am carried inwards. Reminded of the olden day caravanserais, I take refuge in the shade of an arcade and gaze. 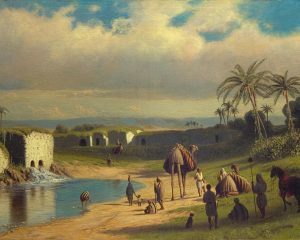 Historically, the oasis was the centre of life around which Arabic society grew, a chain link in a web of exchange. In Sakaka, we see the library creating a dormant centre. By turning this place into a haven of green, the new library becomes a new oasis. 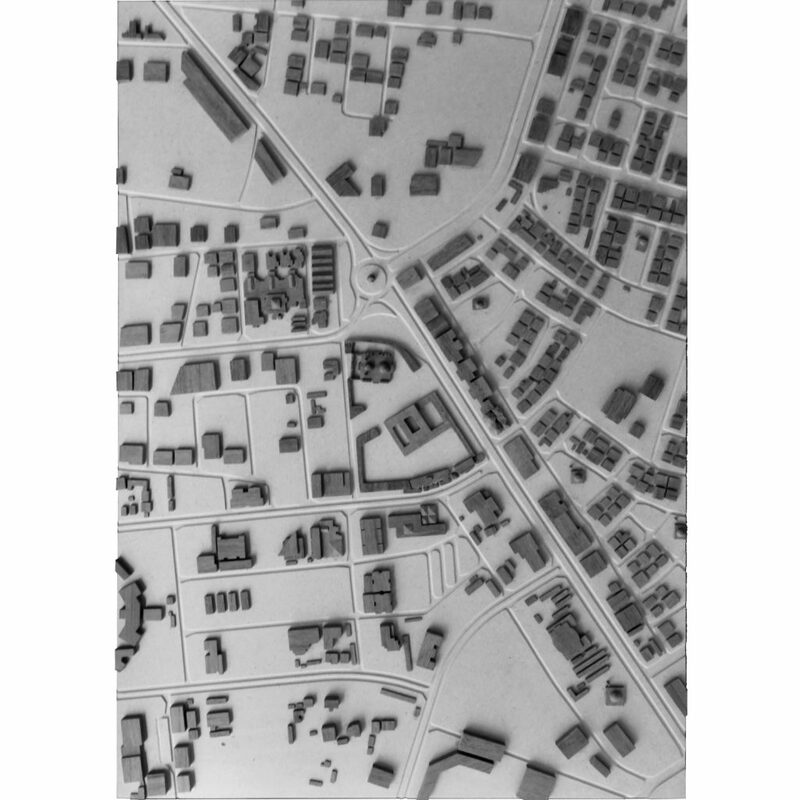 And by enclosing its garden, the empty centre of Sakaka becomes defined, unifying the many scattered urban blocks around it. In the ‘charged’ space that lies between the two ‘magnets’ on site – the library and mosque – a green boulevard connects the parts of the city to the north and south. Someone tells me this is a library. I scarcely believe it because the oasis is aflutter with people sitting, walking and talking, as they would on an outing in a park. But it seems that the veil protects the conversations within, keeping them out of sight, shrouding the library in mystery. Intrigued, I walk to where it seems as if the silky veil has been lifted by hand – creating a portal into the other side. To retain the existing trees, our intervention is made compact. The ample open space generated by this doubles up as a transition space between the various pockets of the locality, especially the schools that have access to it through arcades to the north, or direct access from the west edge. A meandering habitable wall wraps around the site, housing cafeterias and galleries, which can draw people in. This urban gesture makes the library as much a place of social congregation, as it is a place of knowledge. This lends the proposal an intriguing paradox – of having to blend collective and quiet spaces. To retain a semblance of calm, the place is pedestrianised. The masses of our intervention are subdued to respect the scale of the mosque. The major attractions for the public are the intricate ‘veil’ and the oasis. The language of the proposal also draws its cues from that of the mosque, which is like a thick mass that is approached through a ‘walled’ court. Thus, the library and the mosque now enter into a more coherent dialogue with each other. Crossing through the veil that shrouds the library, I encounter a world very different from the one I just left behind. In the gentle shade of an intimate forecourt, water guzzles. I feel like I have been gently transported from the public to the private realm, much like in the old works of Islamic architecture. The existing library’s structure is retained, while two courtyards have been added on as extensions to its existing footprint. These act as buffers that shield the quiet internal spaces of the library from the collective spaces around it. One of these is a forecourt attached to the cafeteria, which is the library’s public front, and it acts as a transition space before people can enter the main library. The other court is a secluded court to the north, meant for children to enjoy their own private corner. 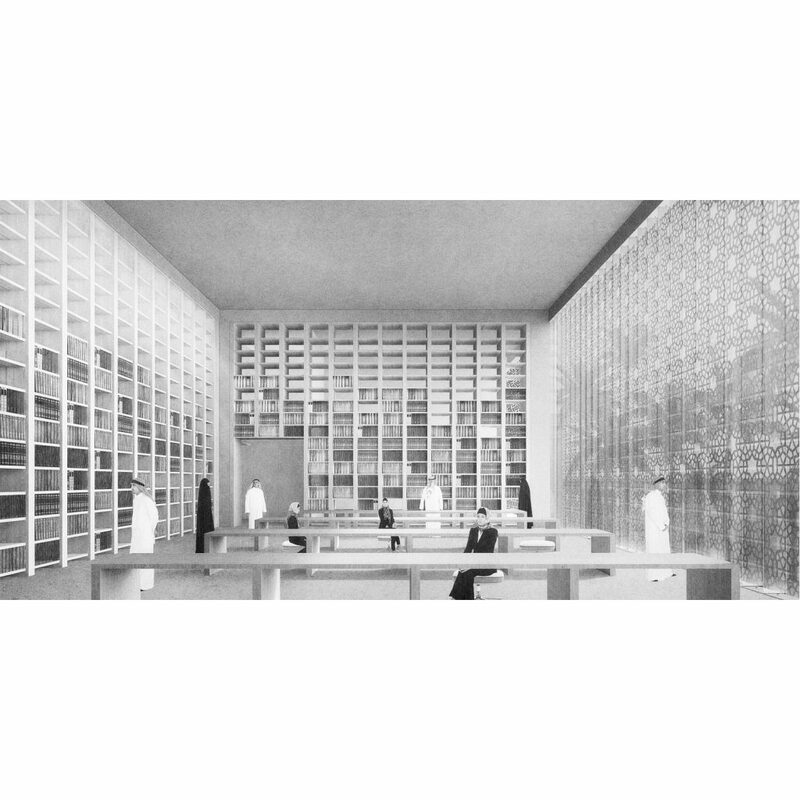 The library’s skin is transformed into a translucent veil, in an interpretation of the jali walls of Saudi Arabia. This dapples the harsh sunlight of the region, bringing chilly breeze into the inner spaces, ensuring that they remain degrees cooler than outside, and also breaking the mass of the building into a delicate translucency. Coupled with the courts containing plants and water features, this maintains a comfortable microclimate in which one can focus on reading. I feel as if I have walked through stages of unfolding, all the time aware of my own senses – of the striking drop in temperature, of the aroma of orchids, of the touch of the cold stone veil on my fingertips and the sound of water. Within, the reading rooms overlook intimate courts. I gaze through the veil onto the oasis outside, as veil upon veil of foliage part to reveal hints of the city beyond. The library building consists of a double-layered façade: an outer perforated veil made from locally quarried sandstone that shields the building from the sun and allows in breeze, and an inner layer of translucent operable louvres that allow views out towards the natural surroundings, even while in their fully closed position. The proposal deploys traditional strategies for controlling the microclimate, like shaded walkways, plantations and water features. 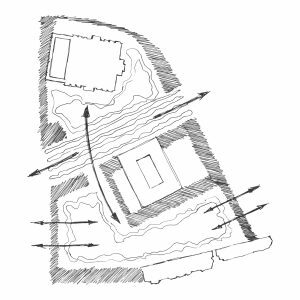 Shaded walkways connect all the essential programmatic spaces within the complex, while a large central water feature, accessed via the cafeteria, forms a focal point of the library building, serving as its primary climate modifier. Integrated passive and active ventilation systems maximize sustainability. Along with the double-layered façade, an advanced HAVC system reduces energy usage. Other energy-saving components are suggested, like LED lighting and automated lighting control to synchronize with daylight.